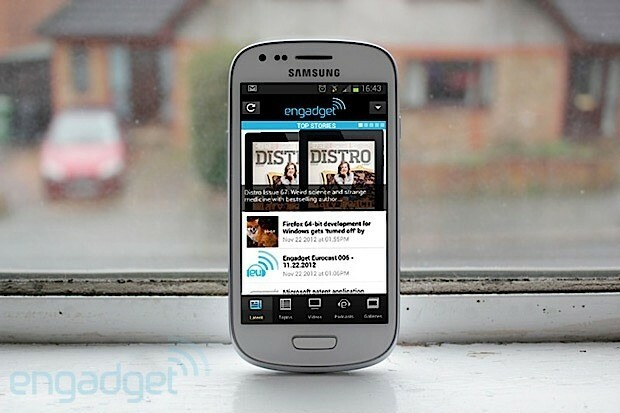 Samsung made a bold move when it announced the Galaxy S III mini. Here was an Android phone with the potential to take the iPhone 5 head-on. While the original Galaxy S III is clearly the flagship, its 4.8-inch display means it's literally too much for some people to handle. By matching Apple's screen size inch for inch, it could have been pitched as a device aimed at winning over some iOS fence-sitters. However, when you look at the specifications: a dual-core 1GHz processor, WVGA (800 x 480) display and a 5-megapixel camera, it's clear that Samsung had other ideas, opting to fish for a more mid-range customer instead. Fast forward to the present, and it's no longer a matter of intellectual debate as to what the mini is all about: the phone is here, and on sale in much of Europe for £299 / €379. So hubris, brand appeal and pundit talk aside, is this the real-deal Galaxy S III, just for smaller hands? Or is it a budget phone simply wearing its elder sibling's tuxedo to the ball? We spent some time getting to know the phone in an attempt to find out.